LadyCup colors in real life! I wanted to make a post with photos of the ladycups in real life to illustrate their actual colors. Hopefully this helps those keen for a ladycup choose the color they'd like. cherry, lavendar, summer plum, wild honeysuckle, strawberry, sky blue. green, pink, blue, tangerine (not orange? ), yellow. These colors are very soft. 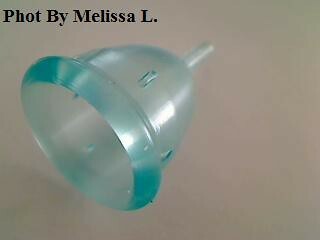 It makes me wonder if the green and blue aren't from the defect cups? I haven'd found any real life pics anywhere. Post a pic in the comments if you have one. submitted via email - photo belongs to friend of the submitter. It would seem that maybe this cup was called turquoise, but they realised it wasn't really very turquoise after all (think MeLuna's "Cyan"), and that they therefore renamed the cup and adjusted the color on the company photo. Yeah? And compare the difference (the bags are different, but otherwise the difference is rather subtle). I cannot find any photos of the "turquoise" cup that have the turquoise bag, rather than the skyblue bag. If anyone wants to post some pictures here of their ladycup, or links to other discussions about the colors, or reviews on the colors, please do! Thank you for this. I never noticed how the holes go at an angle on these. The colors are great. Below the pic for summer plum, lilac, defect lilac, there is Melissa's one for which you wrote "pink(?)" 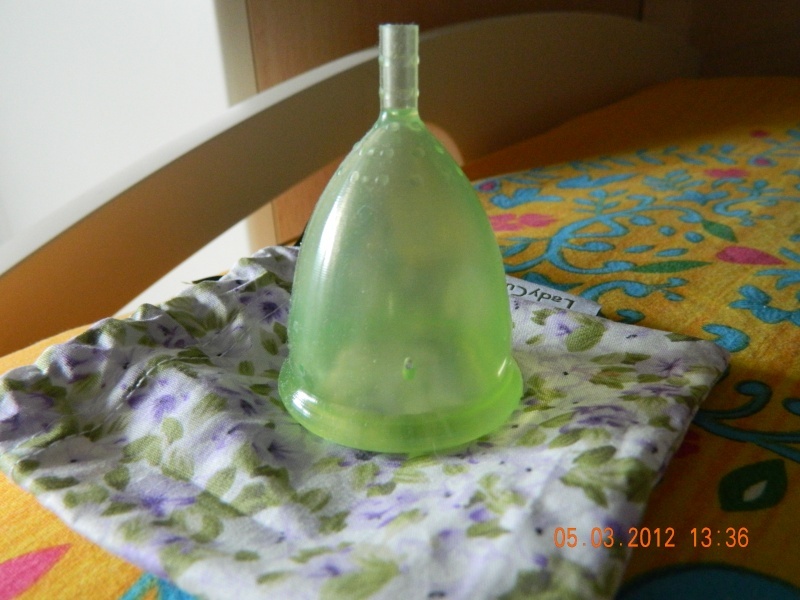 This may still be on her facebook page as well (Menstrual Cups zana), in the photo albums. As for Feminine Wear's photo, it may be yellow and blue. oh wow, i haven't heard of this anywhere. if you have a reference let me know. 1. Thanks, I will change it to Lotos. 2. Hmmm, I'm almost certain that's not the traditional blue in feminine wear's photo. The traditonal blue is just too different to be confused with the skyblue. And now, have you seen the brand new red one on their website, from their “I love fruit” collection? It looks pretty gorgeous. “ “Wild Cherry” is a Ladycup of a deep light red color in a white-red-black cotton sachet." It'd be nice to find an 'in real life' pic for the Lavender one, so that we'd be able to compare the lavender, lilac, plum and even blue or pink guava cups ;o). I know! I'll keep an eye out for any pictures of the touch of lavender one. As well as the other new colours: cherry, strawberry, and the re-released turquoise! Ooh, I had no idea they were about to re-release the turquoise cup! Maybe the tint will even vary a bit from what it was then. http://distilleryimage4.s3.amazonaws.com/8bd7e8ea09a811e3a68422000a1fb163_7.jpg I found a picture of the Wild Cherry cup. Not sure if there is a filter used for this shot or not. The color looks very full. Not really transparent at all. I just love that bag!